The Media Centre at the Parkside Building is now available for commercial use. The facility has been built to a fully professional standard with the latest possible generation of equipment. 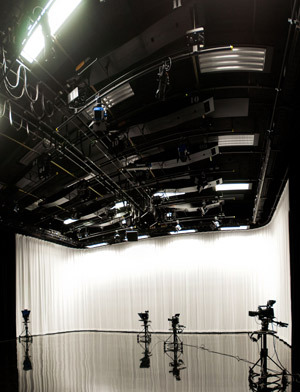 With seven radio studios including a state of the art dubbing theatre, six Photographic studios, four TV studios and a Green Screen with MiLO camera Crane; all with post production. This is an integrated centre, where all the different broadcast facilities are able talk to each other; so that radio can work alongside TV and TV can work beyond the studio spaces in the building. Should you be interested in these facilities — including studio hire — please provide your name and details so we can contact you with our rate card and more specialist information in advance of our launch, once these details are confirmed.